The beautiful community of Sunset Harbour is located in the North Myrtle Beach area in South Carolina.There are many beautiful raised beach style homes that overlook the Intracoastal Waterway. 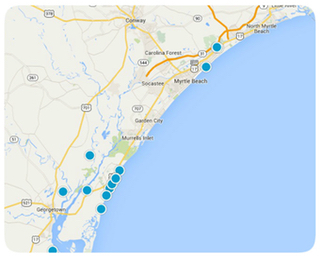 Residents love the communities close location to the ocean and the Intracoastal Waterway. The homes here are quite affordable when you compare them to other communities near the water. The homes vary in size, small homes are around 1500 square feet and larger homes are around 3000 square feet. There are many areas for residents to enjoy shopping, dining, entertainment, nightlife, golf, and outdoor recreation. Residents are also near all of the amazing attractions that are located in the Myrtle Beach area. Feel free to take a look at the beautiful homes we have available and let us know if you have any questions or interest. Listing courtesy of KingOne Properties , Tony Warren.